1. What’s new in the redesigned SAT? 2. What are the primary skills assessed by the redesigned SAT? 3. What is the format of the redesigned SAT? 4. What kinds of scores are reported by the SAT? 5. What will colleges do with my SAT scores? 6. What control do I have over my SAT scores? 7. Should I take the ACT as well? 8. What is the best way to prepare for the redesigned SAT? 9. How can I get the most out of my study sessions? 10. When and how often should I take the SATs and Subject Tests? 11. What should I do the week before my SAT? 12. What should I do on test day? 1 WHAT’S NEW IN THE REDESIGNED SAT? 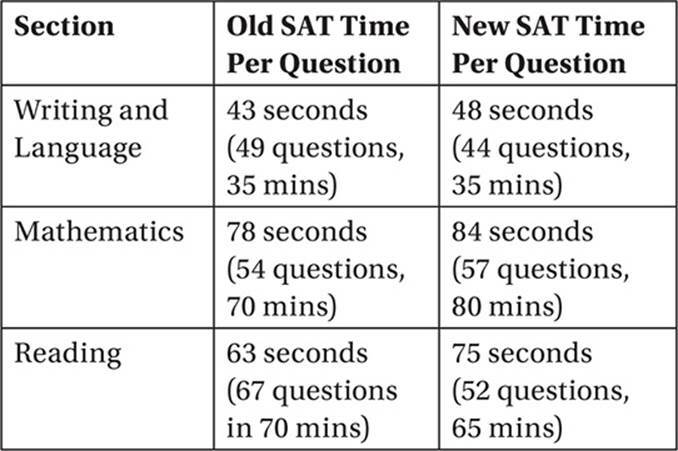 Beginning in spring 2016, the redesigned SAT features ten major changes. The redesigned SAT gives you more time per question, making it less likely that you will underperform due to time restrictions. Bottom Line: The new SAT should give you a bit more time to breathe. The redesigned SAT no longer penalizes you 0.25 point for getting a multiple-choice question wrong. Now your raw score on each section is simply the total number of correct answers on that section. The College Board claims that this will encourage you to make educated guesses, and discourage you from “thinking strategically” about whether to guess on a question, since that is not central to the reasoning skills the SAT is designed to assess. Bottom line: On the new SAT, answer every question. On the toughest questions, just pick an answer and move on rather than leaving it unanswered. You can’t hurt your score, and you may help it. All multiple-choice questions now have four choices instead of five. This makes guessing on tough questions even more beneficial, since the chances of getting the question right by luck alone have now increased from 20% to 25%. Bottom Line: All the more reason to guess rather than leaving a question unanswered. The SAT no longer includes “sentence completion questions” or any other specifically vocabulary-focused questions. Rather, it tests your knowledge of vocabulary by challenging you to read and analyze college-level prose in the liberal arts and sciences, and to answer questions about how vocabulary is used to clarify ideas, establish tone, and indicate point of view. Bottom Line: Chapter 3 discusses how SAT vocabulary is changing and provides comprehensive “new SAT” vocabulary and root lists. The redesigned SAT scores return to the 400-to-1600 point scale, based on the sum of the Reading and Writing test score (from 200 to 800) and the Mathematics test score (from 200 to 800). The Essay component is no longer mandatory. Bottom Line: Now you can compare your SAT scores with your parents’ SAT scores! Many competitive colleges will require you to submit the SAT Essay score with the rest of your SAT scores. If you are considering applying to any of these schools, you should choose the Essay option when you register to take the SAT. Check the college websites for their policies on the SAT Essay. Bottom Line: Chapter 6 gives you complete review and practice in the new SAT essay, together with sample essays with complete grading explanations. The redesigned SAT Math test includes questions on topics from trigonometry and second-year algebra, such as complex numbers, trigonometric identities, and analysis of polynomials. Bottom Line: Chapters 9 and 10 provide comprehensive review of these new more advanced math concepts, as well as lots of practice problems and answer explanations. The redesigned SAT Math test is composed of two sections: a calculator section and a no-calculator section. The no-calculator section is designed to assess your arithmetic and algebraic fluency, which are essential to mathematical problem solving. Bottom Line: The practice problems in the math review chapters (7 through 10) will give you plenty of practice in both calculator and no-calculator problem types, so you can hone the particular skills you need for every possible SAT math question. Some of the passages in the redesigned SAT Reading and Writing tests include information in the form of graphs, diagrams, or tables that you may be expected to interpret and synthesize with the content of the passages. Bottom Line: SAT Reading isn’t just about textual analysis anymore, it also includes a bit of graphical analysis. Bottom Line: Don’t worry for a second about all these extra scores. They’re just the College Board’s way of showing you that it’s really good at statistics. The only scores that really count are the Math score and the Reading and Writing score.